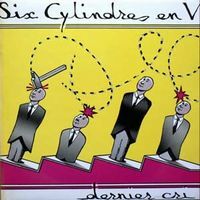 Hailing from Reims, in France, SIX CYLINDRES EN V (Vee-Six in English) were an exceptionally competent RIO band active between 1980 and 1984. They released their only official album in 1984 on the Ayaa label (founded by keyboardist Denis Tagu of Hellebore) "Dernier Cri", which is an interesting and relatively unknown work, consisting of 9 tracks. Their sound is reminiscent of RIO bands such as Etron Fou Leloublan, Aksak Maboul and Stormy Six and other similar chamber prog-orientated bands, like Hellebore. Consisting of seven members, viz. Yves Colombain, Patrick Cuisance, Marin Favre, Yves Menut, Antoine Prawerman, Jean-Marc Sohier and Benoît Proust - all playing an array of instruments, including saxophones, violin, trombone, trumpet, clarinet, tuba as well as drums and percussion - the band certainly offer an interesting sound that many fans of the RIO scene will enjoy. Their music is mostly instrumental, full of different time signatures and chocked full of melancholic and toe-tapping melodies with a jazz bent (due to the use of horns). All tracks are written by the band members, except for non-band member Frédéric Neimann, who wrote "4/4 Coda". 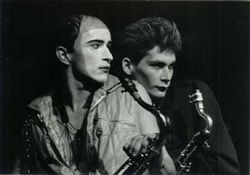 There was also a self-produced (but unofficial) live album from 1982 called "Live At St. Exupery Center" which extends many of the tunes that would later appear on "Dernier Cri" and shows how proficient the band were live. In 1982, "Wao" (a track that appeared on "Dernier Cri"), appeared on a compilation album by artists on the AAA (later Ayaa) label, called "Douze Pour Un". If you like your RIO/Avant-Prog joyful and jazz-tinged and you enjoy chamber-prog bands that dabble in the cheerfully melodic, then you cannot do any wrong by listening to Six Cylindres en V.
Six Cylindres En V was a short-lived combo from Reims, France, found in 1980.After some live performances they recorded an album for the RIO-oriented Ayaa label at the Bresse-sur-Gosne Studio in November 84' with Jacky Barbier as a producer.The line-up at the time was Yves Colombain on trombone, Patrick Cuisance on saxophone/flute, Marin Favre on vocals and multiple instruments, Yves Menut on vocals/trumpet/flugelhorn, Antoine Prawerman on clarinet/bass/vocals, Jean-Marc Sohier on tuba and Benoit Proust on drums. A weird band indeed, in ''Dernier cri'' Six Cylindres En V produced out of fashion RIO music in commercial running times regarding the tracks' duration, influenced mainly by Jazz and even Classical Music, with their style being dominated by unusual rhythms and twisting lines.With a huge section of wind instruments their sound was basically driven by the trombone, sax, clarinet and tuba, offered in a classic 70's RIO style with some light atmospheres throw in for good measure.The music is quirky and usually dense with multiple wind-instrumental operations and little vocals, passing through melodic lines ala MIRIODOR and frenetic patterns with a sharp sax, a tricky trombone and a crying clarinet.There are some discreet Latin and Funk influences to be found, but the bulk of the album follows the marching sections and naughty exercises of the RIO movement.The one and only track flirting with the 10-min. mark, ''Midi a 14 heures'', is quite an epitome of the RIO fundamentals and propably very hard to be swallowed by the public at the time, full of inventive breaks and solos on wind instruments and some strong Jazz Rock tendencies due to a pronounced rhythm section. Little info can be found around the band members after Six Cylindres En V disbanded in mid-80's.Menut propably remained within the jazz circles due to some youtube videos, Favre pursued a personal music career, while Prawerman played with the Jazz groups ''H'' Septet and La Grande Formation and worked as a producer. Well-played RIO, more surprising is the fact that the band sounded totally uncommercial in a hard period.Nice little gem for fans of the style and lovers of wind instruments.Recommended. Catchy and flowing. Chamber rock and jazz are present, but there's also quite strong march music influences somehow. Compared to Panzerpappa, Miriodor, Volapük, Débile Menthol, Etron Fou Leloublan, for example, Six Cylindres En V is a bit more traditional. 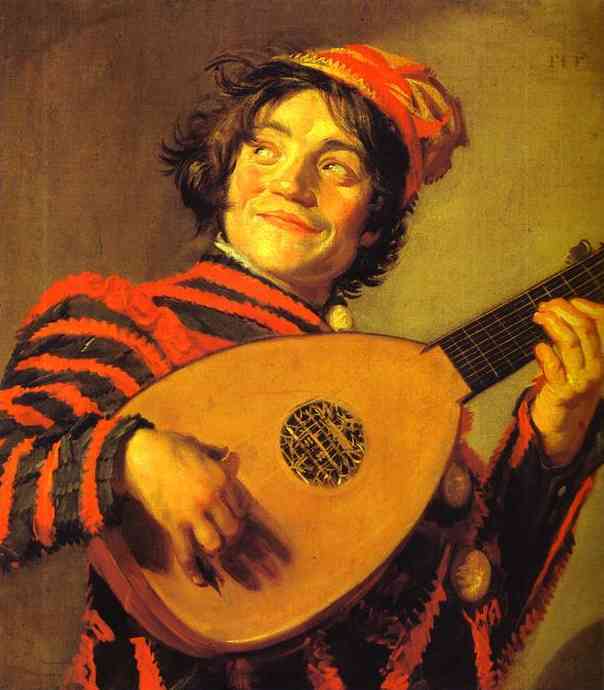 It is instrumental that also diminishes the playing/fooling around (Well, there's some choirs etc.). Trumpets, tuba, clarinet, trombone and of course strong sax and drums are still cheerful. Maybe even too cheerful and even boring - sounds almost like a funny movie's background music. Yet, there's nice original astonishing things here and there, and the music doesn't differ so much from those other French style chamber rock bands, though, for example Univers Zero is much more distinguishing and dark compared to all those mentioned. One good thing about Dernier Cri is that it's fairly harmonic and not irritating. And there's diversity, for example from folky chamber music to ALAMAAILMAN VASARAT's bluesy desert jazz that transforms into samba that's totally different mood (4. Marche Piedenez). And those parts melt into a jazz - like if the whole concept named jazz, generally, is based on those two styles. My favourite songs are Mobile (5.) that has much different parts with much rest/pauses, and more avantgardistic even minimalistic touch and WAO (6.) that continues almost krautrock-like "monotonic" pumping that emerges from the previous song, but with bigger intensity. Folk music, like something like klezmer music and some zeuhl (some vocals and for example the strong drums) can be also found on this album. If you're not acquainted with this kind of music, I maybe don't recommend this album (also because it's instrumental), but even if you aren't and you like many kinds of subtle jazz/fusion, I do. I myself wouldn't say "I do" for this in church, but for being (only) nice, I still must give 4 stars (Maybe 3 ½). Thanks to Geck0 for the artist addition.